Click here to read the latest newsletter online. Daria Hardgrave with Freddie Ponder at Table Restaurant, Nice Hotel, New Plymouth. When chatting to chefs around the country and especially our Beef + lamb Ambassadors, one of the most common themes amongst them is encouraging and imparting knowledge to the new generation of chefs coming into the industry. When you have reached the pinnacle of your career it’s wonderful to be able to look back at your own journey and what led you to where you are today. Even the mistakes made throughout one’s career can be turned around as opportunities to learn and grow for the younger generation. So when Service IQ suggested partnering up an apprentice with each Ambassador Chef to get some real hands on experience at each of their Ambassador Series dinners, it was a no brainer! After all these are the future Beef + Lamb Ambassadors of New Zealand and what better way could there be to inspire and excite young people to stay in such a fickle industry, where the work can be hard but results very rewarding. Daria Hardgrave is in her first year as a chef apprentice working at Marinovich Seafood restaurant in New Plymouth. 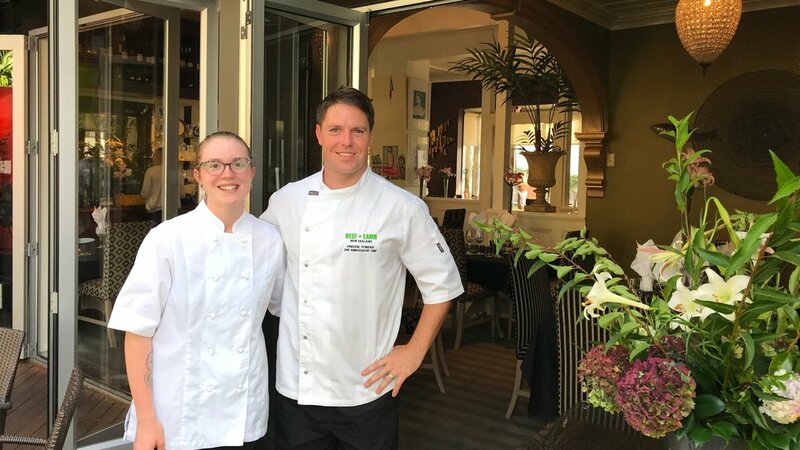 Through Service IQ Daria jumped at the opportunity to work alongside Freddie Ponder and Mat Mclean at their recent Ambassador Series Collaboration at Table Restaurant in New Plymouth. It was her first experience of working in a kitchen serving up a six-course degustation menu to a full house and Daria said the thought of it was a little scary and nerve racking. However, with two of New Zealand’s top chefs guiding her, Daria said she was also excited to learn from the best and pick up as many new skills as possible. Daria grew up around the hospitality industry as her parents owned a café, so she had always enjoyed helping out in the kitchen. She jumped at the chance to take on an apprenticeship and says even though working full time and studying is pretty full on, she knows that this is her career calling. Once she has finished her apprenticeship and graduated, Daria wants to travel the world to gain as much international culinary knowledge and experience as she can. She then wants to return to New Zealand where she says chefs are spoilt for choice with such an abundant array of freshly grown produce to work with. It was great to see Daria learning from our Ambassador Chefs and we are sure their inspiration will stand her in good stead with her career. Winning young chef Alex Southwick with competition organiser Marc Soper (left) and Sebastien Lambert, technical director at Le Cordon Bleu (right). Beef + Lamb New Zealand were proud to be supporters of the recent young chef competition the 2019 Concours National des Jeunes Chefs Rôtisseurs de la Nouvelle Zelande. The competition is a bi-annual event run by the New Zealand branch of La Chaine des Rôtisseurs. The competition is headed up by Marc Soper, executive chef at Wharekauhau Estate. Marc says the competition this year saw an outstanding group of promising young chefs competing for the grand prize of representing New Zealand at the international competition in Canada later this year. Each competitor was presented with an identical mystery box and had three and a half hours to prepare a three-course menu for four people. The box contained mandatory and non-mandatory items to be used and a choice of beef or lamb for their main protein. Winning young chef, Alex Southwick impressed the judges with his main course dish of roast lamb leg with smoked potato foam, honey glazed baby carrots, green bean purée, chicken livers, carrot crisp and stout jus. Alex’s attention to detail stood out along with his skill of showcasing the true essence of what the protein stood for. He didn’t overcomplicate the plate but allowed the lamb to be the hero with its flavour shining through and was well supported by traditional accompaniments with a modern twist. Alex, who is currently working under the executive chef at Blanket Bay in Queenstown, will travel to Canada later in the year to compete against other winners from around the world to determine who will be the International 2019 Jeunes Chefs Rôtisseur. Marc says the New Zealand competition is set up in a way to give the winning student as much experience as possible to compete in the international competition. “It’s exciting for Alex to have this experience and will stand him in good stead for the international competition. We have great hopes for him and look forward to watching his career develop” says Marc. We will also be following Alex’s career with interest and wish him all the best for the international competition. 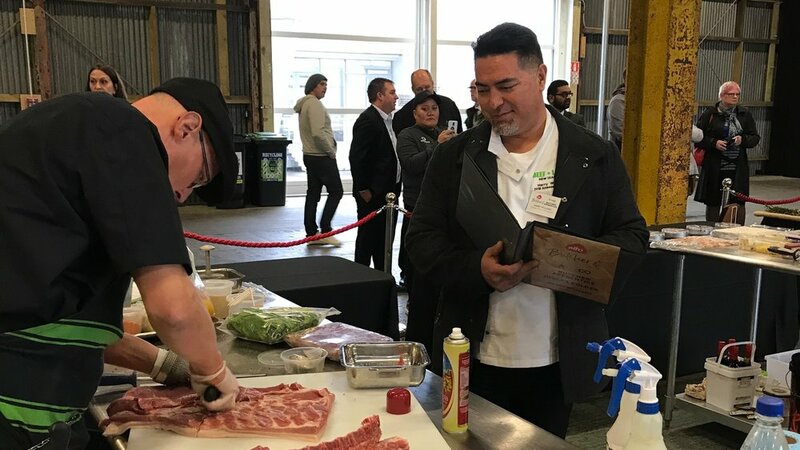 It’s great to see these young chefs putting themselves out on the international stage and showcasing New Zealand beef and lamb at such a high level. Alex’s main course of roast lamb leg with smoked potato foam, honey glazed baby carrots, green bean purée, chicken livers, carrot crisp and stout jus. Guess who eats at a butcher’s shop? Over the other side of the world, on an unassuming street in Hackney, North London, nestled between a greasy spoon café and a non-descript red shop front is Hill & Szrok – a self-described ‘Master Butcher and Cookshop’. By day, this store looks like what you’d expect – a butcher shop – selling organic and free-range meats. The store prides itself on emphasising provenance, giving ‘local lads’ apprenticeships and respecting the animal by utilising every last bit of the carcass. But, by night it takes on another guise – the cookshop – a 15th century concept where shops that sold food would also cook it for their customers to eat, usually at communal tables. Fast-forward to present day and the team at Hill & Szrok have given this idea a 21st century make-over creating a lively neighbourhood restaurant. However this store, with a split personality, has one string to it’s bow that will make Kiwis sit up and take notice. Peter Gordon, arguably one of New Zealand’s greatest exports, who runs two of London’s top restaurants just a few miles down the road in central London chooses to eat at the unassuming but self-aware Hill & Szrok as much as twice a week. Gordon, who was speaking at the New Zealand Foodwriters’ Conference this week, described the food at Hill & Szrok as ‘simple but with amazing quality meat’. So, if you’re planning a trip over to Britain consider putting Hill & Szrok on the hitlist of places to visit – after all if it’s good enough for Peter Gordon, it’s good enough for us. But if you’re a butcher looking to broaden your horizons or diversify your business perhaps this Jekyll and Hyde concept might provide the inspirational spark you were looking for. So, if you’re planning a trip over to Britain consider putting Hill & Szrok on the hitlist of places to visit – after all if it’s good enough for Peter Gordon, it’s good enough for us. But if you’re a chef looking to broaden your horizons or diversify your business perhaps this Jekyll and Hyde concept might provide the inspirational spark you were looking for. I have spent the last 12 years working on the Foodservice portfolio for Beef + Lamb New Zealand and during this time I have certainly met quite a few chefs. Since we took over the management of Retail Meat New Zealand eight years ago, I was pulled in on occasions to work with butchers and it’s been my observation that both chefs and butchers share a similar passion for their trade. Both strive to take the product grown by our farmers and transform it into an end product which is enjoyed by so many on a daily basis, whether it be in a home kitchen or a high-end restaurant. The relationship between the farmer, the butcher and the chef is multifaceted but at the end of the day it all ends up on the consumer’s plate in some form. From a chef’s point of view they rely on their meat supplier to deliver a premium product so they can add their creative prowess and the perfect finishing touches to serve tasty and creative dishes showcasing the meat as the hero. From a butcher’s point of view they strive for perfection in their trade by adding value to cuts to inspire customers to take something home that’s a little bit different. They also work hard to meet the demand from chefs who want something a little bit more out of the box to provide the wow factor on the plate. With the likes of bone marrow, offal and secondary cuts being popular on restaurant menus, the relationship between butcher and chef has grown into more of a partnership where the philosophy of using the whole animal or ‘nose-to-tail’ is shared by both trades. Gender also shares similarities when it comes to chefs and butchers. They are both largely male dominated industries, however for the women who do venture into a chef or butchery apprenticeship the rewards of making a successful career are huge. We have the likes of our Beef and Lamb Ambassador Chef, Kate Fay from Cibo in Parnell, who this year was the first female chef to be announced as a Platinum Ambassador which is a lifelong status for her contribution to Beef + Lamb NZ. Likewise in the butchery industry we see female butchers winning competitions and going on to compete overseas. Hannah Miller-Childs is a great example here, running her own successful business, The Lady Butcher, and competing as the first female on the Pure South Sharp Blacks team for the past two years. Both Kate and Hannah share the same passion which is clearly evident in their successes and longevity in their respective trades. Last week the butchery industry held its biggest event of the year and what unfolded was a very high degree of showmanship and pride. I asked guest judge, Harry Williams, who is a Beef + Lamb Ambassador Chef, for his thoughts and he was impressed at the passion and creativeness which the butchers were displaying. Harry originally trained as a butcher and made the transition to being a chef after finishing his apprentice as he found himself hungry to move on with his newly acquired skills and put them to good use in the kitchen. After judging the competition last week Harry told me he can see there has been a huge leap in the creative side of butchery, which makes me feel excited for the future collaboration of our butchers and chefs! Applications have opened for the Beef and Lamb Excellence Awards – the country’s longest running culinary awards – showcasing the very best New Zealand restaurants have to offer in beef and lamb dishes. The Excellence Awards are open to restaurants nationwide – anyone interested in applying should head to nzexcellenceawards.co.nz for more information. The Excellence Awards – which are entering their 23rd year – are an institution in New Zealand’s food scene, bringing deserved recognition to restaurants who are delivering quality as well as driving innovation and creativity with New Zealand beef and lamb. This year, over 170 restaurants were awarded with the accolade – and the iconic gold plate which has become synonymous with the Excellence Awards – and it is expected that number will grow in 2019. In addition to the Excellence Award itself, each year five chefs who excel during the assessment period are selected as Ambassador Chefs by Beef + Lamb New Zealand. Freddie Ponder, Head Chef at Tables Restaurant in New Plymouth, is a 2018 Ambassador Chef. “I have really enjoyed my time as an Ambassador Chef – I was honoured to be asked. You only have to look at the calibre of previous chefs who have received the award to know I am in esteemed company. Kate Fay, Head Chef at Cibo Restaurant in Auckland, has been involved with the Excellence Awards since their conception. This year Kate was recognised as a Platinum Ambassador Chef – a lifetime recognition after being selected as an Ambassador Chef for her fourth time – an achievement only equalled by eight other chefs and was the first woman to do so. Following the closing date of the applications on 24 August, there will be a rigorous assessment process carried out by culinary trained assessors who will scour the country and assess on all elements of the beef and lamb dishes. Recipients of the 2019 Excellence Award will then be announced in early December along with the 2019 Ambassador Chefs. The Beef and Lamb Excellence Awards application period is open from 23 July to 24 August. Any establishment open to the general public serving New Zealand beef and lamb dishes can apply for the 2019 Beef and Lamb Excellence Awards. For more information click here. Leading into Kate Fay’s Ambassador Series dinner held recently, Kate held a session with five very lucky Beef and Lamb Excellence Award chefs in her Cibo kitchen. Kate chatted to these chefs and talked them through some of her tips on cooking with New Zealand beef and lamb. It was a chance for these chefs to have an opportunity to chat to an Ambassador Chef, ask questions and talk through menu applications using beef and lamb. Of interest was the use of lamb bacon as a garnish, which Kate often uses on her dishes. She says it adds an intense flavour and interesting texture to her lamb dishes. Kate uses lamb rib to create the bacon and says the lamb flavour is distinguishable straight away but is not overpowered by strong fatty flavours which can come from using lamb rib. The cooking process removes a lot of the fat and the acidity of the brining process also counteracts the fattiness. The end result is a dry and crispy texture so Kate advises to use this as a garnish on a dish with good moisture content to contrast. At her Ambassador Series Dinner, Kate served it with her lamb sausage roll with a pea salad, pea purée and mint gel, which added the necessary moisture and fresh flavour to cut through the intense lamb flavour. Kate prepares the lamb bacon in large batches to save time and to ensure she always has a supply on hand to heat through for service. Below, Kate shares the process of how she prepares the ribs and turns them into her delicious lamb bacon. Step one is to brine the ribs using some pink salt, a bit like corning. Leave the ribs to brine for 24 hours, then take them out, wash them and pat dry. Step two is to braise the ribs in water or a lamb stock using aromatics such as onions and carrots. Braise for about 2 hours at 160°C. Once the rib meat is tender, carefully remove the bones and lay the meat flat on a baking paper lined tray. Place another sheet of baking paper over the rib meat and press flat with a heavy weight and leave overnight. Be careful not to over braise the ribs as you don’t want the meat falling apart. However, Kate says the layer of sinew which remains on the meat is good for holding the meat together. The following day, hand cut into thick slices and press flat again with a heavy weight while baking at about 170°C to avoid curling. Kate says a lot of fat will yield off during this process and once the slices are browned take them out of the oven, allow to cool and store. Gently warm the slices through to serve. You will have no doubt seen media coverage over the past few days and weeks regarding Mycoplasma Bovis and the government’s action to eradicate the disease. The important message to relay to any consumers who have concerns regarding the safety of the meat is that Mycoplasma Bovis poses no risk to food safety. Whilst we are mindful that this is a devastating time for our farmers, we are conscious there are a number of consumer concerns around the meat and its safety. We have produced a fact sheet for you to refer to should you be questioned on Mp. Bovis. Please note this has been written with consumers in mind. Download the fact sheet here. Trends and cooking styles have come a long way from the heavy and rich cuisines which dominated the foodservice industry when Michael first began his career as a chef. The multitude of styles from today’s chefs are inspired by the likes of modernist cuisine or molecular gastronomy made popular by chefs such as Heston Blumenthal and Ferran Adria. These styles are pushing chefs to think outside the common boundaries of food and applying scientific principles to transform ingredients into a multi-sensory experience for their customers. Along with this, urban cuisine taps into the regional pantry with foraging and closer scrutiny of the supply chain being popular with chefs as their customers demand to know the story behind the food being served to them. Add to this the needs of the ever-changing generation of customers and their dietary needs and expectations is putting the heat on chefs in restaurant kitchens. Nelson based Ambassador Chef, Alistair Forster loves to use offal cuts when creating menus to introduce customers to something a little different that they would not be able to create at home. He also likes to educate and train his staff on using different cuts such as sweetbreads to use as an exciting element on the menu and not something chefs should shy away from. Alistair says preparation is key when using sweetbreads to get the best from them. He firstly rinses them in a bowl under cold water for about 10 minutes, then puts them into a pan of fresh water and heats to about 80° C. They are then removed from the heat and left to cool until warm. He then peels the membranes off each sweetbread, which he says is a long process but is a crucial step in the preparation, and places them in a bath of ice, pats them dry and vac pacs them. They are then ready to serve and Alistair says pan-frying them with some butter and golden syrup to finish before serving creates a delicious and exciting dish component ready for plating.